I had a 20m dipole at the back edge of the rear garden that had its feedline running to the deck on the rear of the house. This was used for those moments in Summer when I get chance to sit on the deck and set-up a portable station, usually the K2 or the KX1. A few weeks ago the cord that held up one end of the dipole broke and so the time was right to put up the loop antenna I had planned to try one day. Using Joe Carr’s Loop Antenna Handbook, Jospeh J Carr (K4IPV SK), Universal Radio Research (1999), I had already calculated the dimensions for a rectangular loop for 14.070MHz, which the author claimed would match to 50Ω cable (see the diagram above). Using a slingshot I fired fishing line over the tree and pulled back over some new stronger cord. After putting up the antenna in a vertical orientation, at a relatively low height of 25 feet or so (I am limited by the height of one of the trees), the SWR was measured and found to be over 2:1. I intended the antenna to be used without a tuner so I need to make changes. Assuming the higher than expected SWR was because the feedpoint impedance was closer to the typical feedpoint impedance of a loop, which is about 100Ω, I decided to take the usual approach of using a 1/4 wavelength matching section of 75Ω cable to reduce the impedance. I had some RG59 spare so I cut 14ft for operation about the PSK31 frequency of 14.070MHz, again after using Carr’s book which has a set of useful tables. I did assume a velocity factor of 0.8, but was prepared to cut back further if it was 0.66. Well the theory of the 1/4 wavelength matching line worked and the SWR dropped to 1.5:1. I was happy with that and sealed up the connections. I checked the harmonic frequency on the loop and found that it gave a 1.3:1 on 10m. Now, the losses in the cable will be relatively high, so I suspect the actual SWR will be a little higher on that band. I made two quick SSB contacts using the K2 at 10W and confirmed the antenna worked on 20m and also 10m, which was open and had plenty of 10-10 International phone contest activity. So Joe Carr’s formulae for the lengths to match to 50Ω did not work for my installation, the 1/4 wavelength matching section of 75Ω cable was needed. If you build one with the above dimensions check before you add the matching section, you may not need the section. I still have a high regard for the loop handbook, which is a great resource and has plenty of theory and practical tips on building loop antennas, whether they are full size of small antennas. Indeed, this book has helped guide me through the building of a few small loop antennas for medium wave and short wave listening. More about that in a later post. 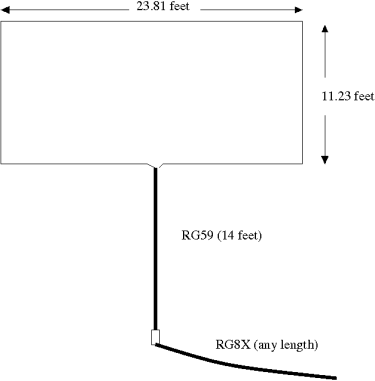 I use an antenna of similar proportions on 15 and 10 meters. It is hung with the narrow ends horizontal and long ends vertical. It does indeed have a 50 ohm match, but only if it is fed on one of the narrow sides. I feed mine at the bottom for convenience. I’m a big fan of the antenna. I have the 10m loop nested inside the 15m loop, which throws off the nice 1:1 SWR a bit. That was a trade off made worth taking because the antenna only needs a single support, and it easy to turn 90 degrees via manual tag lines. I feed both loops from a single coax run tied to both loops. The top is at about 50 feet. That put the bottom a bit low on 20m, so I use a dipole there. But my experiment on 20m seemed to work nearly as well despite the low height. But its great on 15m and 10m – when condx are more favorable. I also found that making the top out of an 8 foot length of aluminum (I used a hardware store U-channel) solved the problem of spreading the loop while only requiring one support, but a length of fiberglass/bamboo/pvc wood do the job with simple wire. On 15m the narrow sides are approximately 8 feet long, so a stock piece off the was perfect. Thanks for the great information (sorry for the delayed reply, I have been on vacation).